UT Austin Behavioral Health Graduate Recruitment Event Friday, May 31 from 8:30 am to 1 pm UT Austin, Utopia Theater, SSW You must RSVP to attend this event. Click on the image below to register. 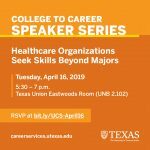 Healthcare Organizations Seek Skills Beyond Majors, featuring Stephanie Pallante of Cigna and David Ong of MAXIMUS Click on the image to RSVP. Welcome to the Office of Student Services!